Died: 12th August 1917; age 31; Died of Nephritis on Chanington Ward of the London Whitechapel Hospital, Middlesex. Employed: in a responsible position with the Central Argentina Railway, South America. Ernest was granted permission to return to England after the outbreak of war to volunteer for active service in the Army. After considerable difficulty, owning to his diminutive size, he was accepted by the Public Schools Battalion (16th Middlesex), from which he obtained a commission and was gazetted as Second Lieutenant in the Sherwood Foresters. 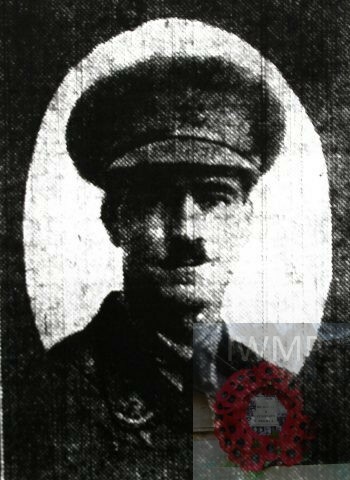 Ernest went to France in August 1916, attached for service in the Loyal North Lancashire Regiment. Almost immediately he was placed in command of his company. Knocked out and injured by a shell fragment during the Battle of the Somme. Contacted Nephritis due to the exposure and the severe conditions of trench warfare. Spent two months in a hospital in Boulogne, before being transferred to the London Whitechapel Hospital, where he bore a further six months of the illness. Regiment: Sherwood Foresters (Nott & Derby Regiment), 19th Battalion attached 8th Battalion, The Loyal North Lancashire Regiment. 1891 ‘Thistlehurst’, Westerfield Road, Ipswich. William Bennett, a Grocer, born Kentisbeare, Devonshire. Harriet Bennett (nee Hodges), 46, born London. John Francis Mills Bennett, 19, a Mechanical Engineer, born Ipswich. Edith Mary Bennett, 14, born Ipswich. Henry Bennett, 13, born Ipswich. Cecil Bennett, 10, born Ipswich. Percy Hodges Bennett, 11, born Ipswich. Blanche Emma Bennett, 6, born Ipswich. 1901 ‘Kentisbeare’, Henley Road, Ipswich. Ernest was 15 years old and living with his siblings. Their eldest brother Walter was Head of the Household. Walter, 25, a Grocer – employer. Percy, 21, an Assistant Grocer. Grace Harriet Bennett, 18, born Ipswich. Ernest attended Ipswich School entered 1899. On leaving in 1902 he served his apprenticeship to Messrs. E.R. and F. Turner, as an Engineer. He continued his studies at the University College, London. Soon afterwards Ernest was engaged in railway work in Buenos Aires. He was a keen footballer, and often assisted the Old Ipswichians in their matches, and on one or two occasions represented them in the Arthur Dunn Cup. Ernest’s father William Bennett died, 1898, Ipswich, his mother Harriet Bennett died 1899, Ipswich. His brother Walter died in 1912, Ipswich. Ernest is also remembered on the war memorial of the Ipswich School chapel. The funeral took place on Wednesday, August 15th, at Abney Park Cemetery, North London. Amongst those who followed the coffin, which was draped with the Union Jack, were Mr. J. F.M. Bennett, Mr. P.H. Bennett, and Captain Cecil Bennett (brothers), Miss F.M. Bennett, Miss Blanche Bennett, and Mrs. Bernard Buckham (sisters). Mr. Bernard Buckham and Mr. Bertram Horn. Some beautiful flowers were sent by the nurses of Chanington Ward, London Hospital, and by the wounded officers lying in that institution.